Well HPE Discover in London was awesome – I must have left an impression last year as various HPE reps around the event remembered me. There was so much to see and I wish I’d taken more pictures but I spent more time talking to people. Let’s take a look at some of the pictures from the event. First off a nice HPE DL380 with an added GPU for dedicated graphics processing. SGI was acquired by HPE and here we see an example of one of their blade chassis which implements water cooling. Here we have an Intel Optane NVDIMM which uses 3DXPoint technology. 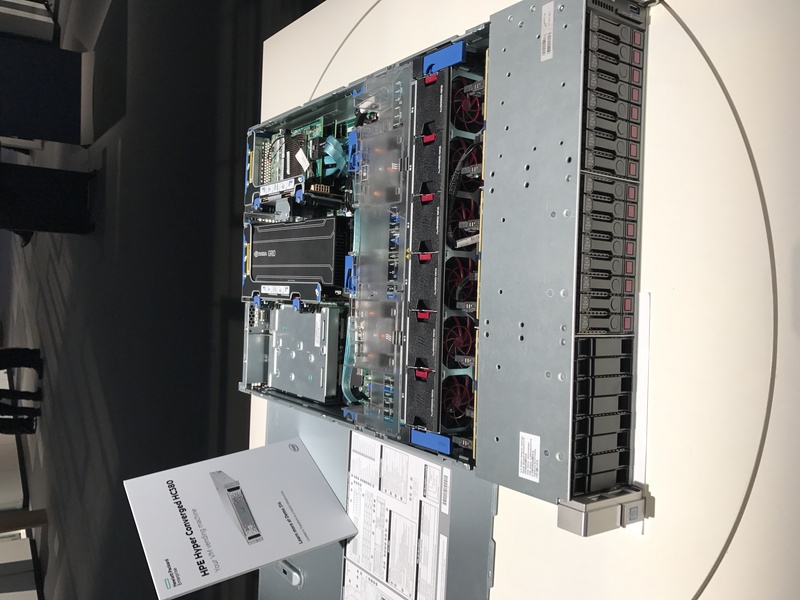 In this case the module is installed into a HPE 3PAR storage array and acts as a read cache to accelerate an all-flash array. Yep – this thing will outperform standard flash so even your AFA can use caching modules! Next up the same stand had a nice graphic demonstrating latency vs cost per GB. We see the progressing trend towards lower latency however cost still has a way to go to match old school HDD pricing. Moving on from all that photonic goodness which is The Machine it’s time to return to more familiar technology. A hyper-converged MySQL setup for example. How about these new 32Gb fibre channel cards! I would seriously love to see an FC fabric running at 32Gb in my datacenters, I can only imagine the throughput and latency we could achieve with the 3PAR SSD volumes. Intel had a great selection of equipment and I had a nice chat with one of their engineers discussing use cases and the engineering challenges. Let’s take a look at some of their solid state devices. ALso note the capacitors which provide power loss protection. The engineer explained the testing Intel do (a lot of it) compared to other suppliers. For example they took a competitors device, snipped the capacitor off and the device still said all was good as it didn’t actively check the hardware. So, moral of the story – ask your supplier how they ensure power loss protection or just buy Intel! Moving on from Intel we have a HPE 3PAR 20000 series controller. I absolutely love my 3PAR and I asked if I could just run off with all the 20000 kit they had but apparently that isn’t allowed… Oh well a picture will have to suffice! The next few pictures are of various setups so I’ll drop them all in one. NVIDIA and AMD were both out in force demonstrating their hardware offerings for graphics acceleration in both blade servers and traditional rack/tower units. OK I really am barely scratching the surface considering how much equipment was on display. As I mentioned I spent more of my time engaging in discussions which is one of the best parts about an event like this. Let’s finish off with some slides from a couple of the presentations – I didn’t take many pictures at these as most of the stuff will be available for download so it didn’t make sense to try and capture all of it. Anyway that being said let’s check out a slide from a DevOps talk and one from a security session. Well that’s it for this year – I really hope I get to visit Discover again next year, it truly is a great experience and I’ve come away with so many ideas and thoughts which will hopefully benefit my organisation.